Is Professor James Gellar real? 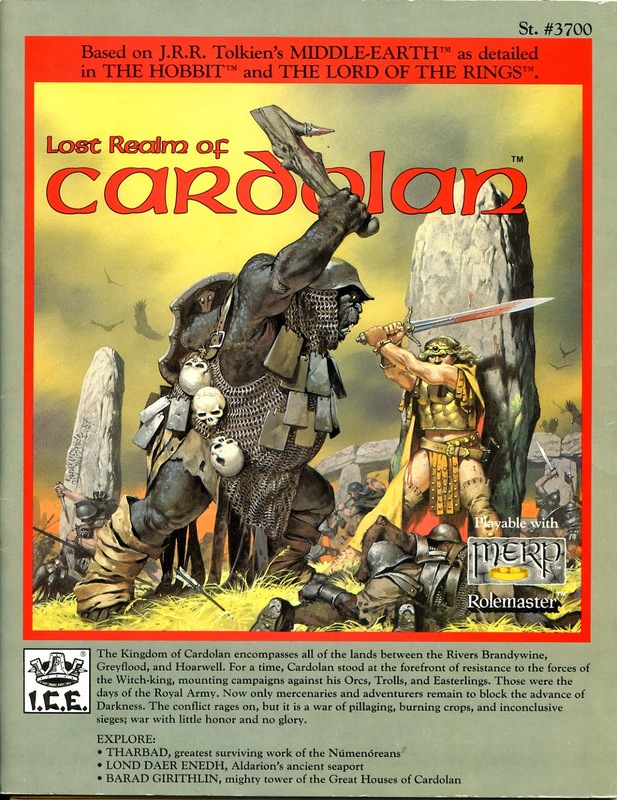 The Lost Realm of Cardolan seizes you right away with its cover. As any collector of these modules knows, Angus McBride was the equivalent of TSR's Erol Otus. But where Otus reveled in psychedelic surrealism, McBride conveyed the solid reality demanded by Tolkien's world which for all its myth served as a pre-history to our own. His artwork, like Otus', had that rare ability to unnerve and fascinate the longer you stared at it. 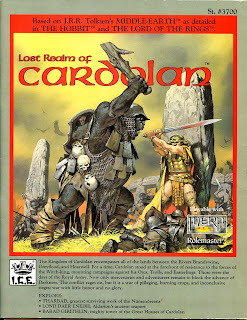 There are veteran gamers who claim they would have never been moved to pick up a D&D product if not for Erol Otus, and I suspect more than a few MERP devotees would say the same about Angus McBride. Since his death in 2007 I've been hoping for a kind of festschrift that compiles his best work... but that's enough by way of praising the cover artist. What about the contents inside the module? They're quite good, as it turns out. Cardolan is wild territory. On the one hand it exudes a sombre dignity, with sites steeped in more nobility than even Arthedain: the river/port cities of Tharbad and Lond Daer founded in the early Second Age, the burial grounds of the Barrow Downs going back to the First. On the other, its politics and landscape are so chaotic, and the princes such laws unto themselves that the king had effectively little control. It was, in fact, more a smorgasbord of seven hirdoms (principalities) than an actual kingdom throughout 861-1409, that when it fell the princes hardly noticed and just carried on as usual, until forced to pack it in around 1700 and migrate to Arthedain or Gondor. The module is geared for the time of 1642 (soon after the Great Plague and the invasion of the Witch-King's wights into the Barrow Downs), long after the fall of the monarchy, but with a little tweaking could, interestingly, be applied to the Times of Trouble (1235-1258), during the kingdom when civil war reigned and the royal compound at Thalion changed hands no less than eighteen times. Colorful personalities are detailed, with stats and bios provided for seven princes, best of all the usurping warlord Ardagor, a half-elf/half-troll abomination who hates orcs even more pathologically than men. The historical timeline is well fleshed out and does justice to a very complex nation. In my opinion, Cardolan is twice as tragic (though far less sympathetic) than Arthedain, being a victim of her own obduracies as much as outside influences like Angmar, and this is seen particularly in the fall from its peak of prosperity in the 1100's from which it never recovered. It's really one autonomy within another, with barons often barely heeding their hirs anymore than the hirs ever did their kings. For whatever reason I always saw this sandbox as ideally suited for TSR classics like Castle Amber and Ravenloft (add to that now Maliszewski's Cursed Chateau), as it's easy to imagine haunted castles perched on the frontiers of lawless principalities. Castles in fact plaster the region, for which there is an abundance of layouts, unlike the sister module Rangers of the North. Most feature the princes' fortress capitals, but there is also the lair of Creb Druga commanded by the elf-troll Ardagor. The more general mapwork, however, is frustratingly piecemeal. The color centerfold displays the Shire to Weathertop along the north, down to the point of Tharbad in the south, which covers three hirdoms and part of a fourth; then there are two single-page color maps, one covering two and a half hirdoms, the other showing one; and it's never clear how the region of Cardolan looks as a whole. To make things worse, there are sloppy mistakes. 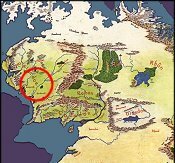 For instance, the stronghold of Girithlin is referred to as Minas Girithlin on the maps, but Barad Girithlin in the text. While Ardagor's lair is well done, it's not clear where it is located on the arial view of the Creb Durga hillsite. On top of all this, the color-coded map of Tharbad is replicated from the adventure module Thieves of Tharbad (to be covered in due course), which is nice in itself, but without that module the codes mean nothing. Rather amusingly, the confusion from all the map and layout work seems to play into the theme of Cardolan's political confusion, and an extreme cynic might wonder if that was intended on the part of the designers. I'll refrain from offering an opinion. The Great Plague period tends to be the setting for most of ICE's modules, and it's better suited for some regions than others. But I actually think it works well for Cardolan, given the massive political deterioration at this point and thus plenty of conflict to be exploited. Also, the undead invasion of the Barrow-Downs is a fresh wound (the wights from Angmar took them over only four years ago, in 1638), which provides great opportunities in conjunction with the Bree module. I agree with you about Thieves of Tharbad: great scenario, and yes, for that city the time around 1409 is much better.